I’m back. I usually like to make my costumes a play on words. Last year’s idea came from me being from New Orleans and a huge “New Orleans Saints Fan” and our saying is “Who Dat”, Who Dat say they gonna beat them Saints!” So last year I went as a “Who Dat” and this is my costume. I bought felt and some batting from my local fabric shop which is really cost friendly. It took my mom and I about 4 hours to cut out, sew and stuff this together. If you are “not” a seamstress, as I am, fabric glue or hot glue will work. I cut out all the owl shape out of the batting and my mom sewed up the sides leaving holes for my head and arms. I cut out the hands, eyes, mouth, feet and made feather shapes. The only two things that were stitched were the hands, feet and tongue which I stuffed with batting for a more 3D effect. I borrowed a Saints football helmet, painted and glitter a Styrofoam Fleur de lis (which someone gave to me) and added letters that spelled “DAT”. 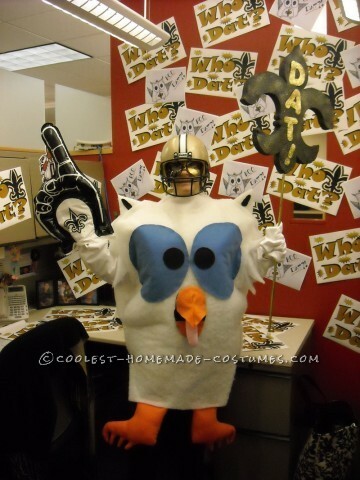 I already had the “number one finger” from one of the give away from the Saints game. I wore this to a Halloween costume party and won most creative. Who Dat!